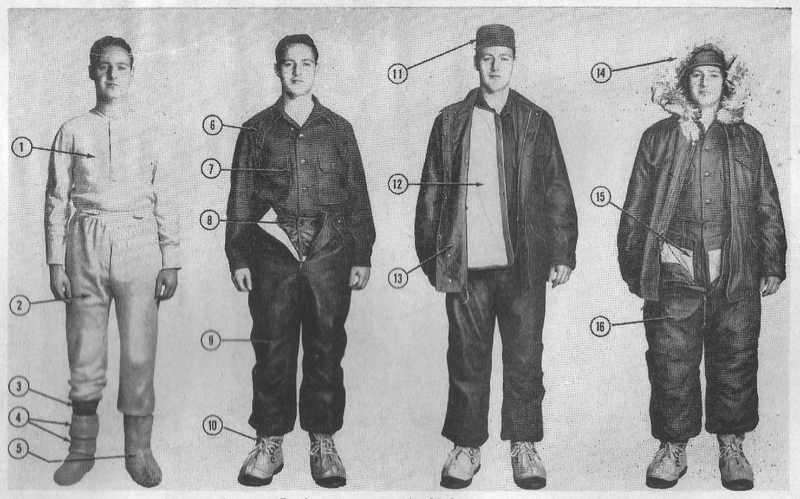 The combination Cold-Wet/Cold-Dry Clothing System (M-1951) can be configured into two ensembles. 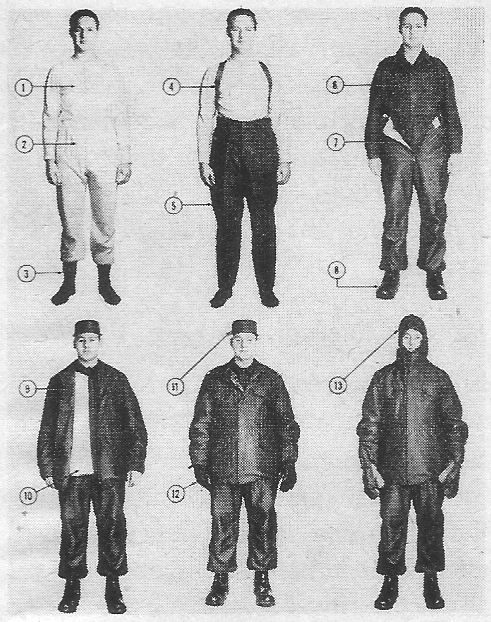 The cold-wet ensemble is worn above 14°F, and the cold-dry ensemble is worn below 14°F. The cold-dry ensemble protects down to -60°F. The cold-wet configuration differs from the cold-dry in the number of layers and the choice of boots. The system uses layers of wool/cotton fabrics to trap air for insulation, and a water-repellent outer garment to maintain dryness. The use of cold weather clothing is affected by two types of weather conditions: wet and dry. These conditions are amplified by humidity coupled with temperature and wind velocity; high humidity (wet conditions), low humidity (dry conditions). Cold-wet conditions occur when temperatures are near freezing and variations in day and night temperatures cause alternate freezing and thawing. This freezing and thawing is often accompanied by rain and wet snow, causing the ground to become muddy and slushy. During these periods troops should wear clothing which consists of a water-repellent, wind-resistant outer layer and inner layers with sufficient insulation to provide ample protection in moderately cold weather (above 14°F). Cold-dry conditions occur when average temperatures are lower than 14°F. The ground is usually frozen and snow is usually dry, in the form of fine crystals. Strong winds cause low temperatures to seem colder and increase the need for protection of the entire body (windchill). During these periods, troops should have available additional insulating layers of clothing. This is particularly true when entering static situations form a period of strenuous exercise. The suspenders may be worn over the undershirt and support the drawers and all succeeding layers of trousers. The shirt may be worn either tucked inside the trousers for additional warmth or outside the trousers for better ventilation. items 4, 5 and 10 of the cold-dry ensemble and pile field cap of the cold-wet and cold-dry ensembles were rescinded in Changes No. 1, 15 January 1963, to FM 31-70, 24 February 1959. Some items were replaced by M65 items. FM 31-70. 1959. Chapter 2.